I’m always on the look out for (good) foundation and almost always for my personal use, I tend to lean towards Drugstore brands because I don’t really stay with one kind of foundation, I tend to go through phases and moods which is why spending on high-end foundation is not always part of my personal makeup shopping. So, I went on a mini haul at Watson’s and got myself some of my personal favorites and kit staples but also saw the new Essence counter so I thought I’d check out their foundation since I haven’t tried it before. On the way home, I was thinking I’d do my first haul video, but this one product stood out for me in a way, which is why I wanted to do a detailed review for this particular product. it is called the Clear and Matt foundation and it is in the shade 03 Sand from Essence Cosmetics. This product claims to be oil-free, mattifying and moisturizing, it also says it has Vitamin E, and is dermatologically tested. If you have oily skin, this kinda stuff sounds like all the good things you could ever want in a foundation, right? Remember when I said that this product stood out for me? Keep reading. 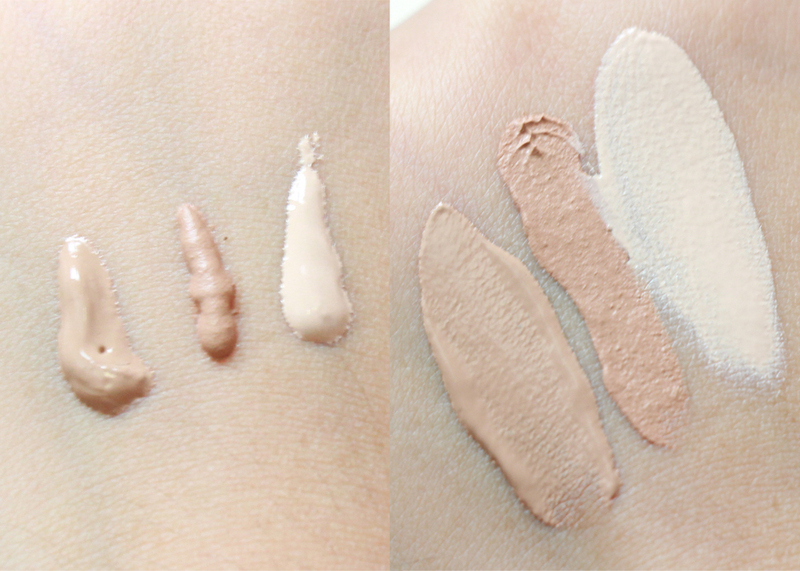 From this photo here, you can evidently tell the thickness and consistency of the products, The leftmost one is a matte foundation, the All Day Coverage foundation from PAC Cosmetics, but yet the texture is smooth, and once blended onto the skin it evens itself out and marries itself to the skin. The rightmost one is a BB cream, and bb creams are usually thicker but this one from L’oreal is so soft that when you spread it to blend, the product is absorbed and becomes one with the skin. Finally, the middle one which is Essence Clear & Matt is visibly “lumpy” in appearance, like it has air bubbles in it. Once spread on the skin, it merely distributes itself, but doesn’t appear to be blending with the skin. Notice how there’s a few ripples / spikes at the top ends of the swatch? That’s how thick and mousse-y the consistency is. The packaging, seems to be okay. It’s one of those squeeze tubes that are essentially good because you can get out most of the product, if not everything when you’re getting through one of these. However, the contents is questionable to me. It says it has 30ml but it doesn’t look like 30ml, it doesn’t feel like 30ml. The coverage is light to medium, and that’s the most I was able to build it up to. It was patchy on initial application and and icky as I tried to add more to build up the coverage. Another thing I’m iffy about is the smell. It has a paint or nail polish solvent or nail lacquer smell and I don’t understand why anyone would put that kind of smell in a foundation. I’d probably be okay with it if the smell dissipated eventually, but this thing’s smell did not go away and even under the powder foundation, I could still smell it. I think I’m being fair here when I compared these two, because they’re both Drugstore foundations and because the skin treatment in terms of highlight and contouring are similar and not as intense as my most recent looks. The foundation used for the Left side claims to be mattifying and the one I used on the right has a moisturizing serum. I set both foundations with the same brand of powder, same amount and areas but yet the left side is showing areas that are appearing to be broken because of the oil (such as the Forehead and nose, even the sides of the nose) and the right side is showing very minimal hints of shine on the nose, still maintaining coverage on the area and the rest of the face. One thing I would like to point out here is that both pictures were taken moments after I finish filming a video, which is usually under an hour to an hour, max. So, just imagine how it would look like on my face if I actually wore it outside. I assume, practically melted soon as I step out of the house. The texture of the product is very uncomfortable to have on the skin, it was thick and pasty that a clean foundation brush left streaks, and my go-to foundation brush; the Real Techniques buffing brush virtually sucked it all up and couldn’t give the skin anything, so I had to use my three middle fingers to get it to work on the skin. Thing is, I hate using my fingers for foundation because it triggers my oil. This is available at Watson’s for P249.00 but despite that price, I’d say skip it. There are better foundations in the drugstore, worth a little more than this but would definitely perform. I think there are even nice ones from Ever Bilena for less but of course, those are underrated. To clarify though, I’m not hating on the brand. Just this particular product. I have their nail polishes and a couple eyeshadows and i’m still looking forward to trying others from Essence, but this was just very disappointing to me. I had some expectations because of the claims it made on the package, so you will forgive me if I’m being really critical about this one. Also, if it was an eyeshadow, or any other makeup product, i would be forgiving, but it’s foundation, and it’s the number one thing you should perfect before you move on into anything. 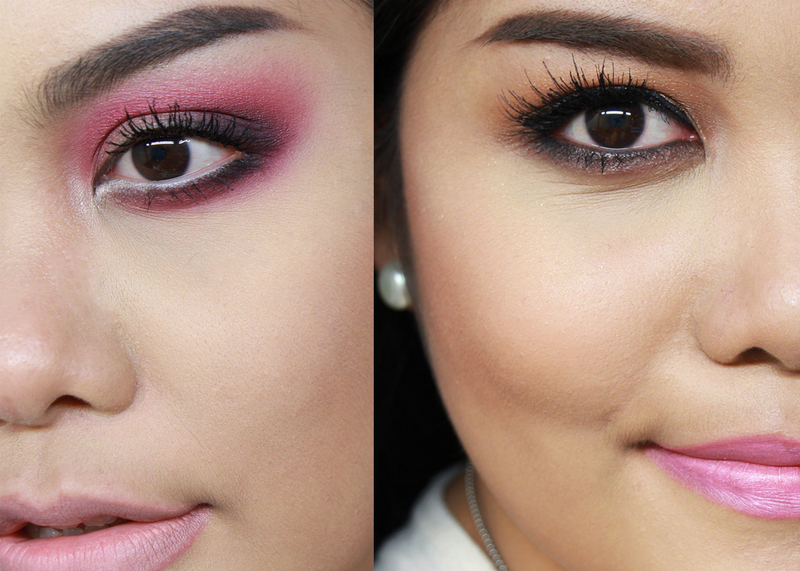 Watch out for my next video, it’ll be a One brand tutorial using PAC Cosmetics!